If you need an advanced frequency inverter drive that offers exceptional starting torque, dynamic speed regulation and quick acceleration, the SMVector NEMA 1 (IP31) provides these features and much more. 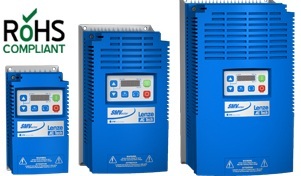 It is the most technically advanced inverter drive by Lenze-ACTech that can be used for a wide range of applications for AC motor control. The drive has several communications protocols, and is one system solution that networks drives and components for today and the future. This particular drive is the most effective as well as the most common due to its NEMA 1 enclosure. It can be used in material handling and conveying, packaging, HVAC setups and positive displacement pumping. Drives within this series can be used to control 3-phase AC induction motors and are available in three options: NEMA 1(IP31), NEMA 4X (IP65) and NEMA 4X (IP65) with an integral disconnect switch. The NEMA 4X models also have filtered input versions for compliance with the CE EMC directive. The drive can be configured for a number of application specific tasks thanks to its programmable digital and analog I/O. Just a few of these tasks include electronic braking, multiple preset speeds and motor jogging. The drive also uses EPM memory technology for fast, efficient programming. The SMVector NEMA 1 frequency inverter comes with a number of options to fit your application needs. Carotron provides personalized service if you have a custom application or need assistance with installation. We’re always just a phone call away!